Making a long distance relationship (LDR) work is not easy, but then again no relationships are easy. Did you know that there is no difference between a LDR and any other relationship when it comes to the rate of success or failure? 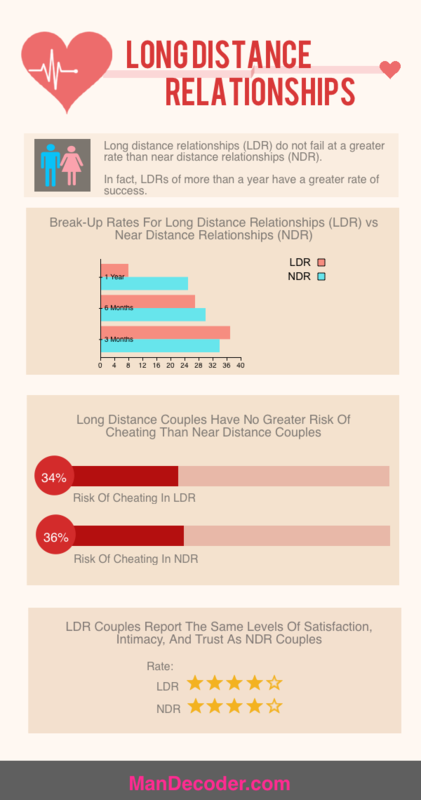 It turns out that distance is not really the most important factor in whether a relationship can succeed. However, LDRs have their own unique challenges. Missing your partner can be unbearable at times when you have thousands of miles between you. The longing you have to be with that person will be never-ending. You may get anxious thinking about your partner meeting other people. Wondering if your partner will stay faithful can be excruciating. If you are dealing with a significant time distance, it can be difficult communicating. Not to mention the extra money it takes to travel to be together when you can. Despite all of the challenges, absence truly does make the heart grow fonder. When you get to see each other after so much time apart, the spark will be that much stronger. Making a long distance relationship work is totally possible, but you should understand that it takes work and deliberate planning. The biggest mistake long distance couples make is following advice meant for regular couples. It’s actually not their fault because there really has not been that much advice created specifically for long distance couples. Rabin has first-hand knowledge on what it takes to make a LDR work, because he ended up marrying the woman he had been in a LDR with when she lived 3,000 miles away. Through his experiences, Rabin discovered there were three simple secrets to making a LDR work. He decided to create the Destroy The Distance system to share what he learned and help other long distance couples have the same success.